A+ on service, quality, and prices! I can definitely taste the quality of beef they use in the brisket and meatballs. I reside right near the heart of Saigon, right down the street with TONS of pho joints, if they keep up this performance, this will easily be my Pho spot. Fourth visit. Clean place with great food and friendly service. 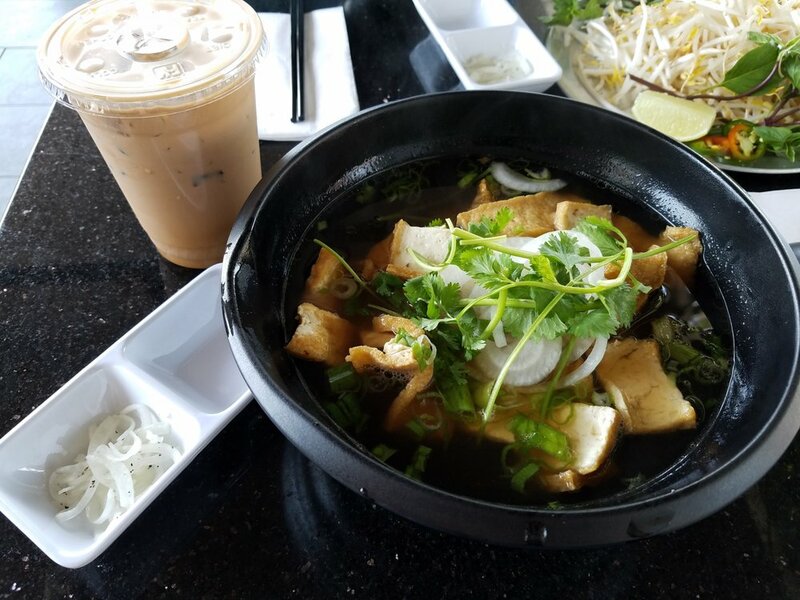 We're big fans of Vietnamese food, so we're delighted to find a good place in the neighborhood. And the food is very good. For example, the grilled pork in the banh mi (sandwich) and the bowls is freshly grilled and juicy, not the tough, dried-out stuff you sometimes get in lesser restaurants. Very interesting location for PHO! The menu is small but they incorporated good drinks and other small dessert options. Atmosphere: very small location with outdoor seating. The staff is very generous and the location is nice and clean. Local spot for pho. The cute cafe is pretty much outdoors so you get a cool breeze while you are eating your steaming bowl of pho! I ordered the angus steak pho and my friend had the meatball pho. You can also have a combination of all meats for the same price. The broth is rich and a little on the sweeter side (which I like!!) I initially ordered the Thai tea but the waitress recommended their LePho house tea which was delicious! It tasted like a combo of almond milk tea and coffee. Great food with great service. The prices are slightly higher than your average Bolsa pho joint but it's definitely worth a try!! I loved the décor in this new pop up Pho shop. It's a very small restaurant at the corner in a small shopping center. We walked around to finally find the front door to be greeted with an overflowing amount of light. Half of this pop up shop was in sun room with about a handful of tables the other half was the kitchen and ordering counter. We walked straight to the wood covered counter to look up to the big chalk board menu that highlighted their food choices. I instantly knew what I wanted; I choose the vermicelli with Angus beef and the Le Pho tea. The staff was WONDERFUL, I had multi questions on the types of the meat I wanted and got nice polite answers also had questions about the beverages that they offered. I asked if I was able to try the Le Pho tea and without a flinch she grabbed a cup to give me a sample. We tacked on some summer rolls that they seemed to feature. We took a seat in the sun room part of the pop up shop. The second part of this spot was al windows and had a really nice breeze going on when we visited so it was the perfect spot to have lunch. I want to say within 5 minutes our food started to come out. Again the customer service was above and beyond a solid 5/5 for me! I took a bite out of the Summer Rolls, instead of pieces of regular pork that spring rolls are normally served with; these were made with braised pork everything else was the same. I thought the rolls could have had more cold noodles on the inside that would have sold me on them even more, but overall they were good served with crunchy yummy peanut sauce. As I was waiting on the vermicelli I took a swing of my Le Pho ice tea, a fruity based tea with thick cream mixed in (Le Pho's version of Thai tea) I actually enjoyed it better than the traditional Thai tea, it had more of a sweet flavor. Before I had a chance to take another bite of the summer rolls the vermicelli came out. When I took my first glance at it, it was a good sized bowl filled to the top. All I can say is - this food was outstanding!!! I had pho for the second time and it was 100 times better than the first. It was absolutely delicious and we also had a beef rice bowl. This beef rice bowl was not like any other that we have had before, it was super amazing. The food was fresh, visually gorgeous and yummy. We also had the most delicious fried bananas to top off this wonderful meal. I was referred by a friend and drove from Riverside. The trip was worth it and we will be back again. Also, the service was great, the staff was so nice and gracious. Thank you Le Pho for the unforgettable meal!